The disease killed more than 2,500 people in the West African state, and a further 9,000 in neighbouring Liberia and Sierra Leone. Liberia was declared Ebola-free by the WHO in September, and Sierra Leone in November. However, Liberia has had new cases since the declaration. "It's the best year-end present that God could give to Guinea, and the best news that Guineans could hope for," Ebola survivor Alama Kambou Dore told AFP news agency. Local health workers echoed a warning from the WHO that vigilance was still vital despite the mood of celebration. "We have to be very careful, because even if open transmission has been stopped, the disease has not been totally defeated," said Alpha Seny Souhmah, a Guinean health worker and Ebola survivor. In a statement, the WHO congratulated the Guinean government and people for showing "extraordinary leadership in fighting the epidemic". 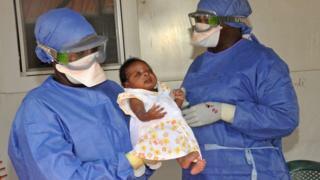 But it also noted that there had been 10 new small outbreaks of the virus between March and November. "The coming months will be absolutely critical," said Dr Bruce Aylward from the WHO's Ebola response team. "This is the period when the countries need to be sure that they are fully prepared to prevent, detect and respond to any new cases." The WHO will maintain surveillance and outbreak response teams in Guinea, Sierra Leone and Liberia throughout 2016, Dr Aylward added. This is another major milestone in the bumpy road to the end of the worst Ebola outbreak in history. It all started in Guinea when the virus emerged, probably from fruit bats, in a rural community deep in the forest. Guinea saw far fewer cases than neighbouring Liberia and Sierra Leone, yet the virus has been circulating there for longer than anywhere else. I remember travelling through Guinea at the height of the outbreak, and there was still a lot of denial about Ebola; people told me it was a made-up disease. Suspicion is still rife in some communities, and many simply do not trust their government. Ebola has made a comeback in Liberia after the country twice declared the end of the epidemic, and there is every possibility it could return to Guinea. It will be up to communities to keep the killer virus at bay, by reporting suspicious deaths and encouraging loved ones to seek treatment if they show symptoms of Ebola. But medical facilities also need to respond quickly, which will happen for the extra 90-day "heightened surveillance" period. A key question is what will happen after that, particularly for the thousands of Ebola survivors who are still facing health problems. The government in Guinea has blamed the virus for poor economic performance and says it has also caused people to distrust the country's health services. President Alpha Conde has doubled the health budget since winning re-election in October.